Florida’s Environment is incredibly rich in hydrological resources. Of the 50 United States, Florida holds an extensive groundwater system, the largest provider of freshwater to human populations in the country. Well known for its majestic beaches, its extensive Everglades, and thriving land and aquatic life, the delicate balance and beauty of Florida’s ecology is a key characteristic of the State. The debate over bringing hydraulic fracturing to Florida immediately raises concerns for the safety of the environment. These are all valid topics to address as we consider the social and environmental risks and impacts of fracking, however, there are many more issues of should also be of concern related to the activity which merit further discussion. Objectively speaking, and despite what oil and gas sector representatives say about oil and gas extraction and commercial production through fracking, the oil and gas industry leaves a high environmental footprint. The social and environmental costs of using fossil fuels to meet our energy needs are high. Yet, the levels of environmental contamination per se have not thwarted other industries that society tolerates, such as leather, paper, nuclear energy, plastics, etc. For each of these industries there are accompanying drawbacks and costs from a social and environmental perspective, in some cases more than in others. The real question we should ask is how much we want to tolerate each of these industries and their impacts, and to what degree will we tolerate them considering the benefits that they offer us? For Florida, for instance, Floridians should ask themselves, are the economic benefits that might derive from promoting fracking, worth placing some key natural resources at risk, including beaches, wetlands, the Everglades, key drinking water resources, etc and are the industry and state promoted safeguards that would accompany the activity guarantee enough to ensure the protection of those resources. Whenever fossil fuels are extracted from the ground, there are inevitable short and long-term environmental impacts to consider. From oil spills and methane leaks, to water contamination and deforestation, to high traffic and noise pollution, and ultimately to climate change, oil and gas production is not a clean activity. The history of environmental damage related to fossil fuel extraction is well documented. The basic risks of fracking carry over from the historical risks that we already know of in the oil and gas sectors, but fracking also adds new risks. One of the greatest impacts that is very particular to fracking stems from the large volumes of water needed to fracture the geology, and the large volumes of water that are contaminated in the process. Other considerations include the vulnerability to the stability of the geology as well as the heightened impact on the climate. “Fugitive emissions, i.e. 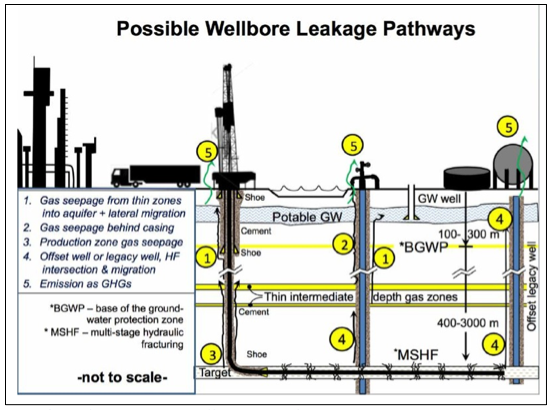 uncontrolled leakages of natural gas from oil and gas wells is a commonplace problem in oil and gas producing areas.” (Dusseault 2014, P.9) Air pollution from fracking is a serious threat to human health and to environmental sustainability. It’s also accelerating climate change. Air pollution from hydraulic fracturing derives from every stage of production, not only the actual fracturing of wells, but also from associated activities, including drilling, handling of chemicals, pressurization of the geology, extraction, transportation, compression, power generation for the pressurization process (generally accomplished with large diesel engines) and deposition of effluents. Impacts may be suffered by local communities living in proximity to fracking operations or by workers that are oftentimes the first exposed. Impacts can also exist at a broader climatological level as emissions leave a fracking zone, and are transported around the region, or even around the world. 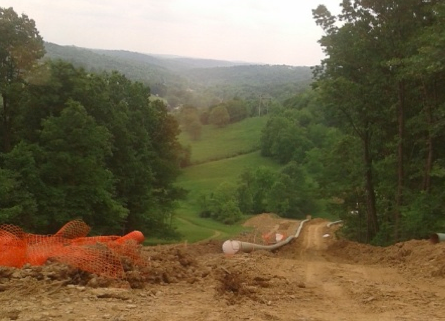 As reported by the Natural Resources Defense Council (NRDC) in a recent report on air pollution from fracking activity, a study commissioned by the West Virginia Department of Environmental Protection found that at many sites, a 625-feet distance from oil and gas activity, beyond the safe distances set by many States, still resulted in benzene concentrations above levels the Center for Disease Control and Prevention (CDC) considers the minimum risk level for avoiding health effects. Communities where fracking takes place have systematically suffered from gusts of pollution-laced winds that swoop into homes, businesses, schools and even hospitals, creating nauseous clouds of invisible air containing volatile organic compounds, such as benzene, xylene, toluene, ethylbenzene, formaldehyde, methane, and even highly explosive toxic gases such as hydrogen sulfide, all of which can make people sick, dizzy, cause faint spells or even cause death. Shale gas can also include large quantities of hydrogen sulfide, which if released into the air, can be deadly, as occurred in some Chinese basins. This pollutant is toxic and can degrade equipment, causing accidents like the 2003 Sichuan well blow out, which killed 243 and injured some 9,000 others through hydrogen sulfide inhalation. It is common to hear from oil and gas companies that they are not responsible for the air contamination found near their wells because a direct relationship between the contamination and their wells cannot be ascertained. We should again be wary of this defense since the complexity of the geology and the difficulty of tracing contamination should not be used to rule out responsibility. As pointed out by NRDC, proximity to fracking activity increases the risk of acquiring air-borne diseases, including birth defects and cancer. Hydraulic fracturing activity is also known to cause damage to the ozone which in turn can cause respiratory and neurological problems for people living in the vicinity of operations, producing symptoms such as shortness of breath, nosebleeds, headaches, dizziness, and chest tightness. Diesel emissions, adds the NRDC, are also a serious problem related to power generation and transport in fracking. Soot from diesel engines can lodge in the lungs causing asthma attacks, cardiopulmonary disease (including heart attacks and strokes), respiratory disease, adverse birth outcomes, and premature death (from pneumonia, heart attack, stroke and lung cancer). 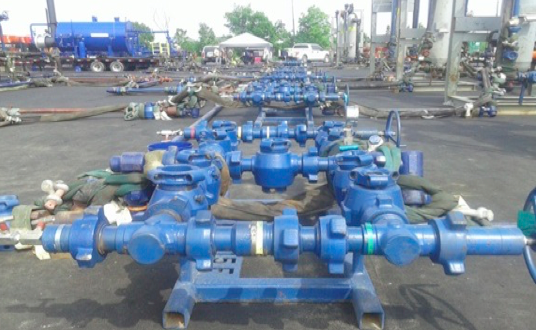 Furthermore, methane, which is a green house gas dozens of times more potent than CO2, leaks not only from the drilled wells, but can also leak from the many thousands of joints in the piping utilized in wells, and in processing equipment. And despite the arguments of the oil and gas industry that fracking shale gas is much more climate-friendly than other energy sources (because natural gas burns cleaner than other types of fossil fuels), in fact, conservative estimates of methane leakages in the oil and gas sector suggest that climate benefits of cleaner gas burning are offset and even exceeded by the negative impacts of methane leaks. Image: EPA recognizes at least 1.5% methane leaks from gas production, although new studies suggest that methane leakage may be up to 5 times higher. 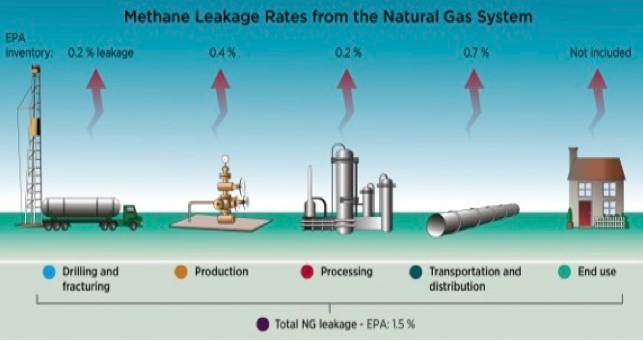 Independent analysis in the U.S. has shown that contrary to official estimates suggesting relatively low methane leakages (1.5%) from Natural Gas Systems, fracking sites may be leaking much higher values of their extracted fuels. 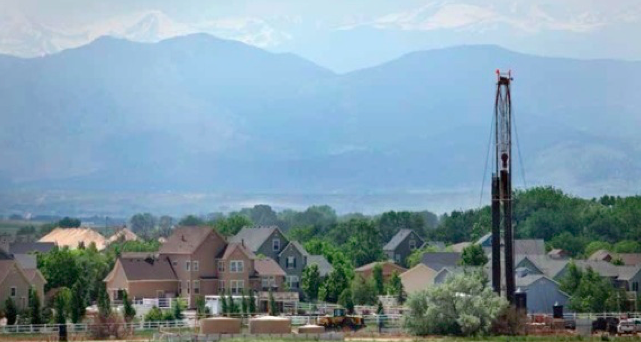 A recent study carried out in Uintah County in Utah State reported an 8% methane leakage rate emitted into the atmosphere by a fracking gas field. This measure was conducted over a period of one month with equipment on 12 four-hour flyovers. Eight percent represents up to 38 times the inventory based estimates from this region and five times the EPA calculated nationwide average. We should note that despite the likelihood that EPA estimates fall short of real methane leaks, the oil and gas sector argues that the EPA overestimates leakages, suggesting that methane leaks are about half of the EPA number. Image: Sources of Fugitive Emissions typical of fracking operations. Source: Dusseault et.al. 2014, P. 15. 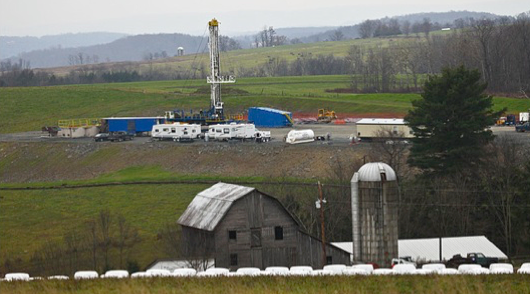 Air contamination from fracking comes in several forms, and is not only related to methane. Other solvents such as benzene present in the industrial effluent as a by-product of fracking can also make its way into the air at a fracking site, including for example hydrogen sulfide, as reported above in the example from China. Fracking impacts to land, both in terms of direct natural resource impacts and to land stability are multifold, but also to be considered are issues of conflicting land use priorities and impacts to topography. Image: Erratic deforestation and destruction of land is common in the oil and gas industry. Impacts of fracking on land range from surface changes, such as deforestation for well pads and road access (which occurs much more frequently than has been presumed), to the stability of the land, which could be affected by the high pressure injected into the geological formation (which has shown already in numerous studies to cause instabilities that can lead to tremors and/or earthquakes). Take the following image from oil/gas operations in Patagonia, South America. One is immediately struck by the extensive invasion of the oil and gas industry, in an indiscriminate pattern of roads and well pads carried out in an erratic, unplanned format. It should be noted that well pad clearance is significantly larger for hydraulic fracturing operations than for conventional oil drilling. 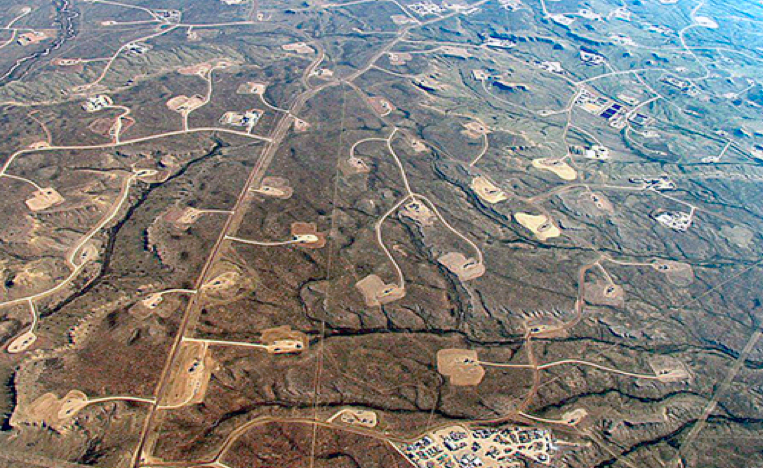 This image is quite typical of the effects on terrain of the oil and gas industry the world over. One fracking well pad measures approximately 2.5 acres (that’s 2.5 acres cleared simply to set up a fracking station). Image: Land fragmentation in Patagonia interrupts natural flow of nature. The industry never restituted these lands following their departure. A quick and conservative analysis of this image (which could be almost any image related to oil and gas operations around the world) reveals that the complimentary access roads that link the platforms require an additional 2.5 acres simply for transportation from pad to pad. That’s a total of 5 acres of land cleared per pad to set up operations at well pads and for connecting roads. The oil and gas sector in Argentina has already explored or extracted fossil fuels at 25,000 wells. Assuming similar rates at each pad, that’s more than 60,000 acres of Patagonian terrain repurposed just for well pads and assuming an equal distribution of deforested access roads that puts total land clearing upwards of 120,000 acres. In the image, more than 250 acres of land were cleared to introduce oil and gas well pads and related access roads. In the case where well pads are carved out into the terrain in off-road conditions, we should also consider the significant amount of dust lifted into the air during clearing operations, during road introduction and use, and particularly during the intense early phases of fracking, where upwards of a thousand trucks must come in an out of the fracking area for each pad. In the following image we see how oil and gas co-exists alongside residential areas. 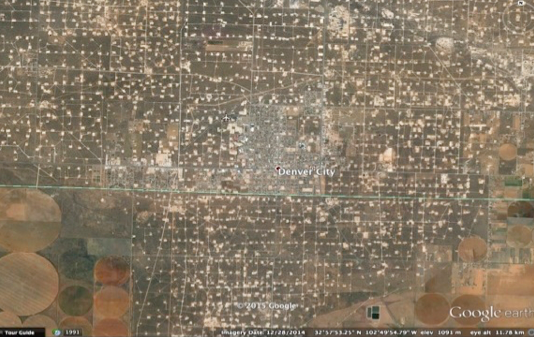 This is the locality of Denver City, Texas, completely surrounded and overrun by oil and gas drilling, a scene typical not only for fracking ventures, but the oil and gas sector as a whole. This fragmentation of the land has a devastating affect on wildlife, which must struggle with newly introduced roads crisscrossing and dissecting their natural habitat. Those lands are mostly abandoned by the sector today, never restored or replanted by oil and gas companies. Another land-use dimension of fracking is the proximity of fracking operations to existing commercial activity, such as farming, and the risks this proximity implies for agricultural product safety and quality. One of the argued benefits of fracking, touted by the oil and gas sector, is that a single well pad can be used to tap the fossil fuels beneath a very extensive area of land, and since only a single well is needed for what may amount to tens of miles of horizontal drilling, the invasive nature of the industry is limited. While it is true that fewer pads are necessary for hydraulic fracturing than in conventional drilling, it is also true that the invasion of the drilling underneath the land nevertheless exists, and subterranean risks are not necessarily preferable to surface impacts. Fracking not only places natural resources at risks from spills and unforeseeable seepage in a large geographical area surrounding the single pad, but the fracking process also competes for water resources over a much more extended geographical area, otherwise allotted to previously existing industries, farms or households. Furthermore, the environment of the area (such as this one) may drastically change with the arrival of heavy industry, particularly in the set up and early fracking/extraction phase of the activity. Large-scale industrial traffic is a major component of fracking activities. Before extraction even begins, heavy machinery must be brought in to construct an access road and build the drill pad and prepare the terrain for operations. Water and fracking fluids and proppants must be brought to the well pad area and then transported away once they are used. The oil or gas that is extracted is also generally trucked away for processing. A study in Texas determined that an average of 592 one-way trips are required to build and maintain a single well, while a New York study estimated 895 to 1,350 truckloads per well. In many instances, the roads in the area are not designed to withstand this level of truck traffic and as a consequence suffer extensive damage. This damage translates to elevated road maintenance costs for the local government and use of public money to repair infrastructure. 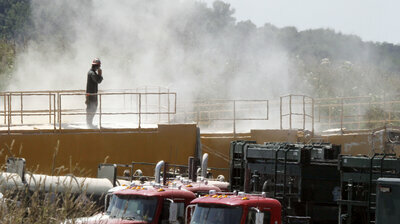 Areas with fracking have also seen a sharp rise in traffic fatalities, according a study by the Associated Press. Oil and gas truckers are not regulated as highly as other truckers, often working longer hours without breaks. Drivers are oftentimes paid per load, incentivizing them to speed. Trucking adds an additional element of air pollution from fracking activities from their exhaust, and spreads it over a larger area. Diesel soot is a human carcinogen and is linked to the development of asthma. Additionally, fracking operations generally take place round the clock, and as a consequence, so does related trucking, making noise pollution a serious health issue for nearby communities. Image: Trucking Volumes flows by well and pad. Only a few years ago environmentalists warned that fracking caused earthquakes. The industry aggressively responded by suggesting such arguments were unfounded and extremist. Today, reputed scientific research is definitively expounding evidence to the contrary, confirming the relationship between fracking and earthquakes and/or tremors. Large clusters of earthquakes have already been recorded in the previously earthquake inactive state of Oklahoma, and costly and deadly earthquakes have been linked to fracking in China, Spain, the Philippines and other earthquake-prone areas. Reports from Texas, where much of the United State’s fracking activity is centered show a correlation between the arrival of fracking and the number of earthquakes registered. Since 2008, for example, the northern region of Texas has experienced a swarm of earthquakes, more than 130 temblors in all. In the case of Oklahoma, in early 2015, the State government embraced a scientific consensus that the increase in the number of earthquakes affecting the State are due to oil and gas operations placing large volumes (billions of gallons) of industrial effluent from their operations into the ground. The State has also published a website correlating earthquakes to waste water wells. 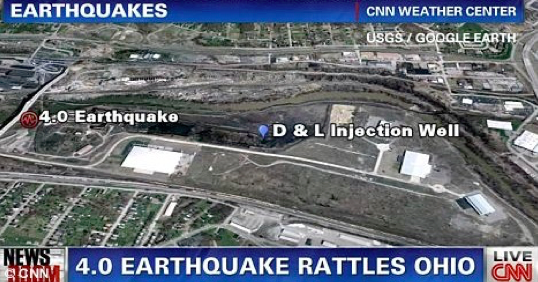 Image: More and more evidence is available linking fracking to earthquakes and tremors.